People have always needed to shelter from the weather, and somewhere warm and comfortable to sleep at night. The design of most homes throughout the world depends on the climate. People living in hot countries need their homes to be cool and airy as possible, while people in cold countries need their homes to be snug and warm. The materials that people use to build their homes usually depend on what they can find around them. 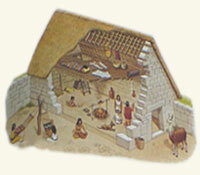 Stone, mud, straw and wood are all natural materials that have been used to build homes for thousand of years. By contrast, many modern homes are built from artificial materials such as concrete, steel and glass. 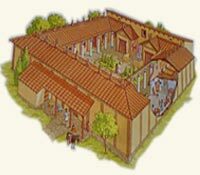 The ancient Greeks built their houses from sun-dried mud bricks laid on stone foundations. The roofs were covered with pottery tiles. Rooms were arranged around an open courtyard so that cool air could build up and circulate through the rooms during the heat of the day. During the Middle Ages, between 1000 and 1500, castles were built all over Europe, in Scandinavia, Britain, France and Germany, and south to the Mediterranean Sea. They were also built in the Middle East during the Crusades. 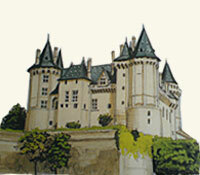 Castles were built by important people such as kings or queens. They were not only splendid homes that the owners could show off to their friends, but military bases from which the surrounding lands were defended. The Incas lived in the Andes Mountains in what is now Peru. They built their homes from large blocks of granite, which they quarried from the nearby mountains. The blocks fitted together without mortar. The resulting thick walls provided insulation against the bitter winter cold. A courtyard acted as a large outside room and as used just as much as the inside of the house for everyday living. The Etruscans lived between the Arno and Tiber rivers in western Italy around 2,500 years ago. 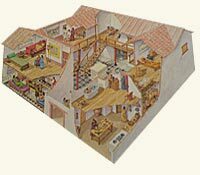 Wealthy Etruscan families built luxurious palaces decorated with beautiful figurines, bronze statues and engraved mirrors. 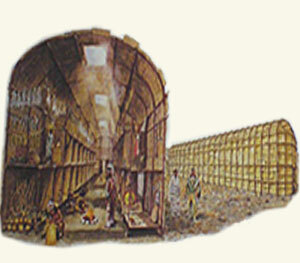 The Etruscans grew rich rich rich by mining copper, tin and iron and trading with the neighboring Greeks and Phoenicians. The Iroquois people lived in a densely wooded region of North America. They built their longhouses using a wooden framework covered with sheets of thick bark. The barrel-shaped roofs allowed the rain to run off. These houses were huge because several families lived in each one.